How to play DVD folder with KMPlayer? How to play DVD folder on hard drive with The KMPlayer? The KMPlayer, or K-Multimedia Player, is a video and audio player for Microsoft Windows which can play a large number of formats such as VCD, DVD, AVI, MKV, OGG, OGM, 3GP, MPEG-1/2/4, WMV, RealMedia, FLV and QuickTime among others. 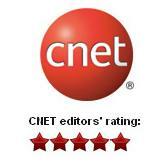 It handles a wide range of subtitles and allows one to capture audio, video, and screenshots. It's a free media player and can be downloaded from The KMPlayer's Forums. KMPlayer supports many audio and video codecs and file formats, but M4V Videos is not included. To play iTunes M4V videos on KMPlayer, you need convert iTunes M4V videos to DRM-free video formats. Noteburner M4V Converter Plus comes to help. Noteburner M4V Converter Plus (For Winodws / For Mac) , a professional iTunes M4V to KMPlayer Video Converter which can help you remove DRM protection and convert iTunes movies and TV shows losslessly to various video formats for playing on KMPlayer. After copying DVD to hard drive as DVD folder with DVDSmith Movie Backup, you can use The KMPlayer to play the DVD folder without any DVD player. The video quality is just as the same as playing on DVD Player. 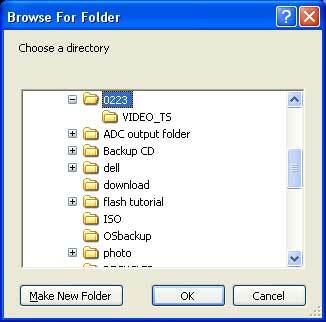 Follow the steps below and you can enjoy DVD folder on hard drive. 1. 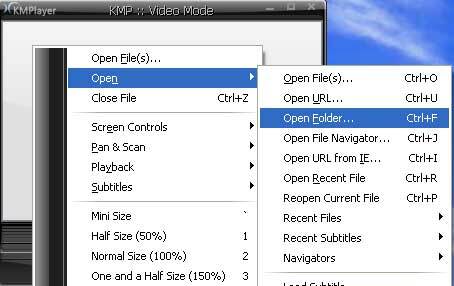 Open The KMPlayer. The main interface of the KMPlayer in video mode is as the picture below. 2. Right-click on any blank in the window, select menu "Open --> Open Folder". 3. Browse the DVD folder copied by DVDSmith on your hard drive and click OK.
4. The KMPlayer will start to play the DVD folder. Have fun now!